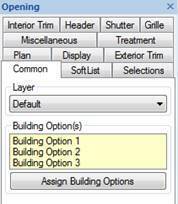 Plan Sets have the ability to display different Building Options of the same floor plan. This provides consistency through the drawings, Utilising the same plan but with different options of design, here are 3 different designs for a sun room, square, hexagonal and rectangular. Each having their own roof designs. Dimensions have been turned off for clearity. 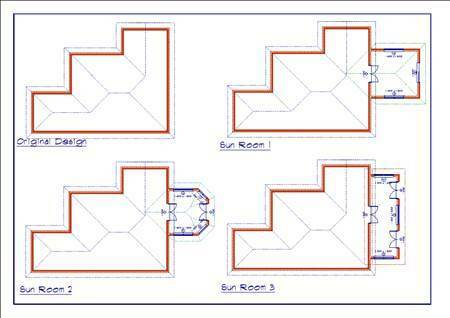 Items can be part of multiple Building Options, eg, the French Doors on this plan could be assigned to Options 1, 2 and 3 as it is common to all three designs. This means there is no need to draw the doors more than once, this again is for speed and consistancy across design options. Crop View command added to the right mouse click. Draw Select command added to Plan Sets. Available on the toolbar. Erase (drawing or view) command added to right mouse click. Drawing Schedule or Table of Contents command added. DWG and DXF Export added to Plan Set Pages. Font Options added for Drawing Name and Drawing Scale. Prefix added to Groups, used in place of the group name when numbering pages. For Example sheets in the Architectural Group may be numbered Arch-7 or A-7. Automatic Labels showing Drawing Name and Scale are added to the Plan Set when a drawing or view is added. Notification added when drawing previously included in a Plan Set cannot be located. Individual pages and page ranges can be sent to the printer. Print added to the toolbar. Edit 3D Views—Regenerate added to right click. Rename Plan Set added to the right mouse button. A Revision Schedule can be added to the Plan Set listing all the Revisions for the Project. This command allows you to quickly and easily reuse an arrangement of drawings, details and views on a different project.